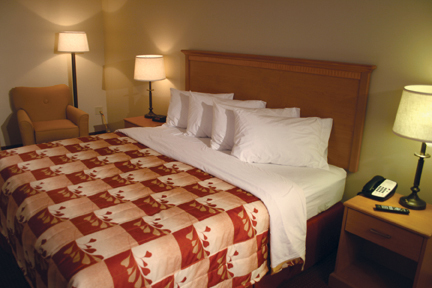 48 room hotel conveniently located on I-35 exit 85 in Lakeville Minnesota. Relax in a restful nights sleep with SoundGuard masonry construction. Pool, whirlpool, and free upgraded continental breakfast. Warm fireplace lobby with quaint breakfast nook. Hospitality meeting room for 30 people. Walk to Cracker Barrel Restaurant. Two queen beds, executive king, whirlpool suite or fireplace suite. Coffee maker, hairdryer & refrigerator in room. Guest laundry. Smoking and non-smoking rooms.